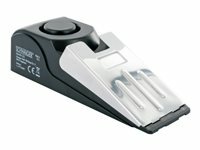 This Schwaiger door wedge alarm is used to secure doors. If a door is opened without permission, an alarm sounds. In addition, the wedge blocks the door, so that it cannot be opened. This way, intruders should be discouraged. The sensitivity of the alarm trigger is adjustable, so that there are no false alarms.